Facebook is a happy, rainbow-splashed place right now. I cannot recall a national moment when we all cheered this gleefully together. I’m sure there are dissenters… but at least in my social media spaces, they are letting our gay friends (and us) have the moment. Just two years ago, Johnny and Deano explained to me how anything other legal Marriage–recognized as the same for all– would never be enough. My boys are young enough to never know a world that prohibited love, and old enough to attend so many fabulous, future weddings that are just… weddings. Love wins. This weekend I attended my first Gay Wedding… an event I highly recommend if you’re lucky enough to have lovey dovey gay friends who are willing to tie the knot, even though our Federal Government won’t recognize the pairing. These state-sanctioned unions are a fabulous step forward (in neon-soled bucks), but don’t afford the same rights and privileges I have with Bernie. And if you, like me, were wondering what those rights and privileges might be, go ahead and Google… there are over a thousand of them. Johnny and Deano–who have been together since I owned scrunchies– explained this to me with great patience: what’s the point of this piece of paper, if it’s not going to be recognized by the institution that takes 35% of their income? I’m ready to swap my swirly skirts for a sandwich board and march all over town. It was only 46 years ago (!) that the Supreme Court decision in Loving vs. Virginia declared any ban on interracial marriage unconstitutional, obliging all 50 states to recognize marriages regardless of skin tone. In 2013, we find these not-so-ancient anti-miscegenation laws ridiculous in their assertion that any human being is somehow less, and not included when we stand hand over heart and pledge Justice for All. And yet, here we are in 2013, with our fellow human beings still fighting for basic human rights. I look at my handsome husband and adorable little half breeds and cannot help but make the comparison, no matter how strongly smarter, lawyerly types contend that these are apple-and-orange arguments. To me, it’s the same. And there is no way for us to explain DOMA to our children without sounding like the hate-mongering weirdos who tried to keep people like me and Bernie from making little Brodies and Teddies only 46 years ago. 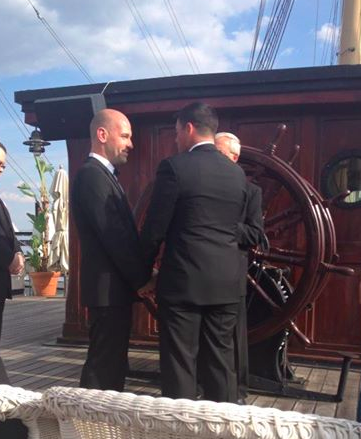 Now I’m going to swap my sandwich board for stilettoes and tell you all about my fun evening aboard the Moshulu in Philadelphia, where Brett and James stood before a teary audience of well-wishers and promised to love and cherish each other forever. Uncle Jim, a retired minister and longstanding friend of the family was the honored celebrant, and he chose his words thoughtfully. This union, he explained, was a coupling of best friends and lovers, recognized by the District of Columbia in April, but blessed by God today. There was no doubt amongst any of the hanky-blowing witnesses that Brett and James were entering the institution with anything other than grave respect, irrepressible love, and sheer delight. And our parents, all of them striding into their eighth decade, embraced the moment in their black tie best… disproving all sorts of assumptions about a boatful of Republicans. I was proud of them, too. Neither. Instead, Uncle Jim reminded us of the quaint tradition of sealing these before-God-and-everyone moments with a kiss. And they did. So we blew bubbles, then drank bubbles, and then tore up the dance floor in our stilettoes and neon-soled bucks. In ten years time, I hope all of us have a Gay Wedding story. I also hope it will be far fewer than 46 years for youngsters to cringe at any archaic “gay” designation for a union between two people who want to share everything from china patterns to children to tax forms. Weddings will be just… weddings. Love is love is love. For everyone. Saying, “I do” before God and everyone. Your way with words is always a treat. Well put Britt! Every word. I really don’t understand men and men, but I am glad that you were able to attend and share with your friends, and that you had a fantastic time!!!!!! It was a fantastic time in fabulous shoes. Britt, I dont know you but Thank You for writing such a great Blog. I shared it on my wall for friends and family to see. James and Brett are good people and we wish them the very best on their future together. Wow. A huge compliment. Thank you for reading and writing these sweet words. Terry Its not for you to understand!!! It’s for everyone to accept the reality that our world is changing for the better. Everyone deserves the right to be happy whether it’s man and man, woman and man, woman and woman, There will come a time in this world when this dosen’t have to have a debate or question. Congrats to Brett and James. I’ve known brett for about 10 years and I’m really happy for them both. Great post. Wonderfully balanced. Personal and reflective…and done with a perfect point of view. Everyone is so very lucky to have each other as dear friends. I love that you wrote this, and hate that you felt the need to … still…great words and am a sucker for a happy ending. Wow 46 yrs ago…I hope we can move faster and love your colorful description of the guests, red and blue, old and young. Congrats to your friends!